Middle Island, Ontario -- Black birds swirl around this uninhabited Lake Erie island just north of the Ohio border, testimony to all that has gone wrong with the Great Lakes invasion of the double-crested cormorant. Once considered an environmental success story, the cormorant has gone from near extinction to overpopulation. Middle Island is ample evidence why the cormorant is now reviled as a bird that destroys habitat, gobbles game fish and pollutes air and water. The Great Lakes population of Piping Plovers has been on the endangered species list since 1986, when the number of nesting pairs dwindled to 17. These days the number of nesting pairs is up into the 50's. But biologists say the bird still needs protection. Lisa Gamero coordinates the Piping Plover Patrol for the Michigan Department of Natural Resources. Gamero says nesting sites are becoming scarce as the birds compete with people for lake frontage. "Their habitat needs are basically, kind of a wide open beach, with a lot of small pebbles or cobbles, sand, and they usually have to be within a hundred feet of the water, and the nearest vegetation needs to be about a hundred feet away from where they decide to put their nest." NEENAH â€” A pair of endangered peregrine falcons has produced two young in a manmade nest atop Minergy Corp.â€™s plant overlooking Little Lake Butte des Morts. Wisconsin has about 20 pairs of nesting peregrine falcons, but Riot and Karla, as the birds have been named, are the first known to have taken roost in the Fox River Valley. WALKER, Minn. - Chris Anderson is only half-joking when he offers a solution for the hungry cormorants that are eating the fish in Leech Lake - and taking money out of his pocket. "Kill them all," he says of the voracious, predatory birds. Double-crested cormorants don't get much respect these days. 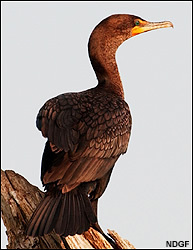 While I don't expect to generate much sympathy for the cormorant, I do wonder about the recent level of disdain and disgust often associated with the mere mention of this fish-eating bird's name. Aerial surveys at the Les Cheneaux Islands in northern Lake Huron last summer found less foraging pressure by cormorants, the black, goose-sized diving birds that each eat a pound of fish a day. Spring is the cruelest season for turtles that live in the Muskegon River marsh. Driven by the need to breed, scores of turtles migrate across the marsh in search of nesting sites that are high and dry. That journey often leads to the highest spot in the sprawling river delta, a 11/2-mile section of U.S. 31 built atop levees that bisect the marsh. It doesn't take a rocket scientist to figure out what happens when turtles cross paths with vehicles traveling 70 mph or faster. The state Department of Natural Resources announced plans Tuesday to trap and kill as many as 20 of the Upper Peninsula's burgeoning population of gray wolves this summer in an attempt to limit attacks on domestic livestock and pets. DNR officials said their goal is to assure a healthy future for wolves in Michigan, which might otherwise be threatened by public backlash against wolves in backyards and farm fields. MARQUETTE - The Michigan Department of Natural Resources will host a series of meetings next month aimed at guiding revision of the state's wolf management plan. The schedule of meetings, slated to begin May 2 in Watersmeet, includes additional Upper Peninsula sessions in Houghton, Escanaba, Newberry, Marquette and Sault Ste. Marie. The meetings will provide the public with an opportunity to identify important issues and express opinions regarding wolves and wolf management in the state. The sighting of four Blanding's turtles last year on and near the shuttered Johns Manville Corp. plant in Waukegan that polluted the lakefront with asbestos has prompted the U.S. Environmental Protection Agency to ask for additional conservation measures during cleanup. Although it is unclear whether eggs have been laid or more turtles may soon be roaming the site, EPA officials said Tuesday that the provisions are necessary to prevent any harm that could come to the threatened species during the construction season. It's not as bird-brained as it sounds. Turning out the lights or closing blinds in office towers and other tall buildings throughout Toronto at night could save thousands of migratory birds from crashing into them, causing death and injury, say councillors and a citizens' group. Councillors Glenn De Baeremaeker and Joe Mihevc will ask city council next week to authorize a staff report to look at ways â€” voluntary or mandatory, including a possible bylaw â€” to save more than 10,000 birds that die across the city annually. By Scott De Laruelle - BARABOO - While folks in Sauk County were shivering and shoveling their way through a Wisconsin winter, a dozen young whoopers from the Necedah National Wildlife Refuge were enjoying the warm weather of sunny Florida. The group left Friday, and workers from Baraboo's International Crane Foundation will help track them as they make their way north. ICF outreach coordinator Joan Garland said 11 of the 12 surviving whoopers that followed an ultralight to Florida this fall left their winter home at the Chassahowitzka National Wildlife Refuge. She said the group only got about 14 miles before they had to stop due to heavy rains. A different kind of cat may lurk in the wilds of Ohio. A really big kind of cat. An eat-your-pet-dog kind of cat. Recent reports of a black panther roaming eastern Geauga County are the latest in a long line of ferocious-feline sightings around Ohio. Residents in this area and around the state have phoned authorities numerous times over the years to warn about the kitties. Nobody ever seems to find the animals, but that doesn't mean they're not here . . . or on the way, researchers say. Weighing no more than a quarter-ounce and barely 4 inches long, the Blackburnian warbler still is hardy enough to make a 2,000-mile flight every spring from the jungles of Central America to breeding grounds around the Great Lakes. But the tiny songbird, known for its fiery orange throat, is no match for the glass and steel jungle of downtown Chicago. TRAVERSE CITY, Mich. (AP) â€” Mercilessly hounded by blood-sucking ticks, the Isle Royale moose herd is on a downward spiral â€” and the wolf packs that roam the national park in Lake Superior are taking advantage. The moose population fell to about 540 this winter, down from 740 last year and 1,100 during the winter of 2002-03, wildlife biologist Rolf Peterson of Michigan Tech University said Tuesday. Meanwhile, wolf numbers jumped from 19 to 29 last season and reached 30 this year.